Africa’s general economic performance continues to recover and gross domestic products (GDP) growth is projected to accelerate to 4.0 percent in 2019 and 4.1 percent in 2020. 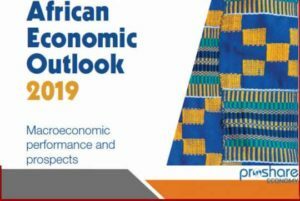 But improved macroeconomic and employment outcomes require industry to lead growth, according to the 2019 African Economic Outlook (2019AEO) report, launched Thursday by the African Development Bank and copied to the Ghana News Agency. Published annually since 2003, the AfDB’s flagship report provides headline numbers on Africa’s economic performance and outlook. The 2019 AEO report analyses gains of regional public goods, including synchronizing financial governance frameworks, opening regional aviation to competition, and facilitating the free movements of people, goods, and services through open borders. Significantly, the report identifies five key trade policy actions that could potentially bring Africa’s total gains to 4.5 percent of its GDP, or U$134 billion a year. It includes eliminating all applied bilateral tariffs in Africa; keeping rules of origin simple, flexible, and transparent and removing all nontariff barriers on goods and services. Again, it added implementing the World Trade Organization’s Trade Facilitation Agreement to reduce cross border time and transaction costs tied to non-tariff measures and negotiating with other developing countries to reduce their tariffs and non-tariff barriers, by 50 per cent. A full set of updated growth projections will be released in May 2019.